No, the appliance does not run from the household power. This shaver is designed to be used with foam or gel in the shower. For safety reasons, this shaver does not work when it is connected to a power outlet because electricity and water are a hazardous combination. The only thing the shaver does when it is connected to a power outlet is charge the integrated battery. It charges through an adapter that converts the voltage from the outlet to a safe low voltage. Nevertheless, we urge you to keep the shaver and the adapter away from water during charging. The adapter is not waterproof. Note: Some models are equipped with an unplug for use reminder. 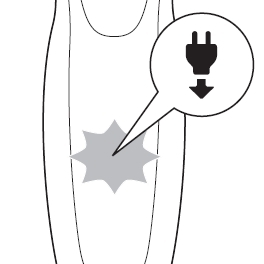 The unplug for use symbol will flash white to remind you that you have to unplug the appliance from the wall outlet.